I ran into the kitchen and saw a smoke coming out of my pot on the stove. My poor crabs got 3rd degree burn, but my heavy duty French pot survived. I simply had to make them again, Urgh!!! I wouldn’t mind eating two consecutive delicious crab meals (I ate the burnt crabs. Luckily the meat inside the shell was still edible) regardless of high cholesterol intake in my body. 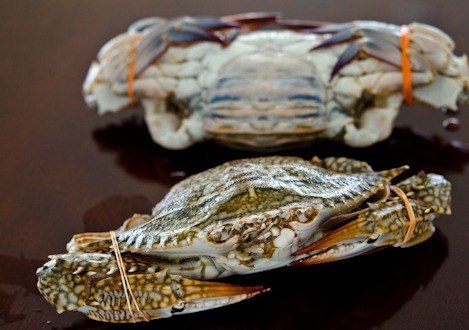 May is a great season to taste female crabs which holds lots of eggs. Their meat is in their best taste now through the summer. Oh, I miss getting blue crabs at Chesapeake bay in Maryland. So, go to your local seafood market and grab some of these clawed ocean friends. I will show you how you can cook them, in Korean way. Finger licking deliciousness…! First thing first. Here are the tributes from the District 12, Katniss and Peeta! Which one is Katinss? … the one on the left. In case you have no clue what I am talking about, I am showing you female and male crabs. If you look at their flaps in the back, the one with wider flap is female and the narrower is male. Also male crabs tend to be more colorful. Because I chose female in the spring it doesn’t mean the male crabs are tasteless. 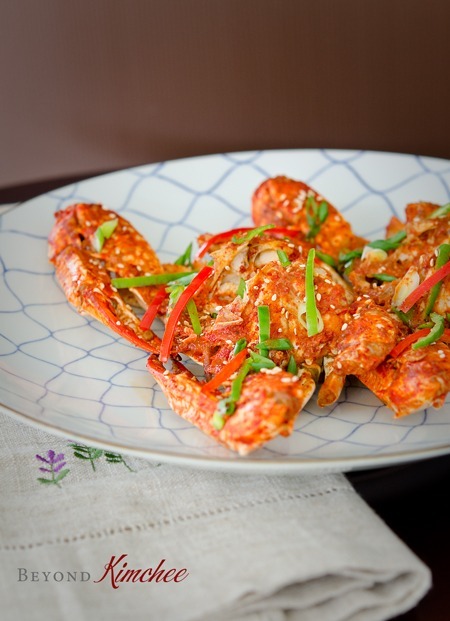 In the fall season, male crabs are better than female in terms of flavor. And this can change depends on where you live, so pick both and compare. Scrub, scrub, scruuuub…, and wash very well. I like to cut off their skinny legs. They don’t hold much flesh and takes up the space in my pot. But Leave the CLAWS! Open up the flap to separate the top shell from the body. And you will discover this wicked anatomy of Crustaceans. Do you see the golden yolk-like substance in the middle? They are eggs. You will want to keep them. But the grey hairy stuff on the sides? Get rid of them. Collect the eggs in the shell and place all the clean crabs in the shallow pot. Now it is time to make the sauce. then take out the anchovies and reserve the stock. 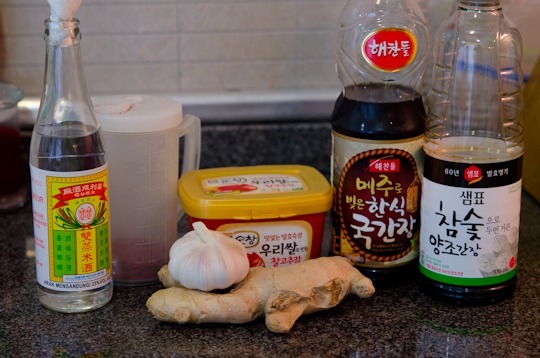 Grab these ingredients; soy sauce, Korean soy sauce for soup, chili paste (gochujang), chili flakes, rice wine, garlic and ginger. Drizzle evenly over your crabs. Brig to boil first and simmer, covered with a lid, for about 5-7 minutes. DO NOT forget about them like I did. Oh, my! The sauce is too die for, guys! 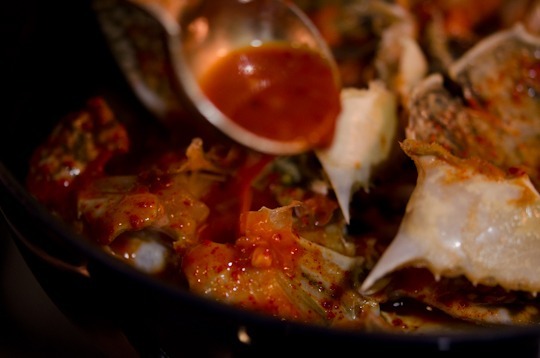 What we, Koreans, do is that we mix some cooked rice with the sauce and place on the shell to serve with crabs. Or drizzle the sauce over your rice in a bowl. Be prepared to be messy. Eating crab is a pure labor if you are not experienced, … and that is part of the game! You’ll love the gentle spicy kick from the sauce made with chilies and soy sauce. in order to play this exciting hunger crab games. … May the odds be ever in your flavor! 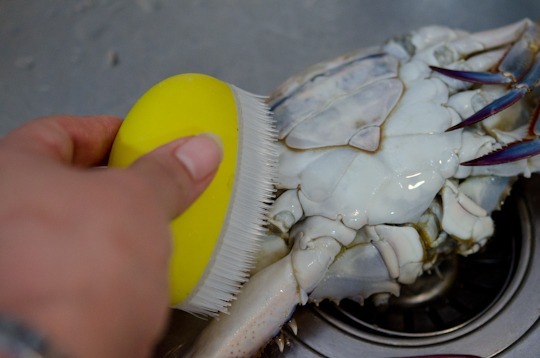 To clean the crabs, scrub the crabs with a brush and rise well. Cut off the 4 sets of swimming legs near the first joint. Keep the claws! Open up the back tab toward the front and separate from the crab. You might see some golden yolk-like eggs inside. 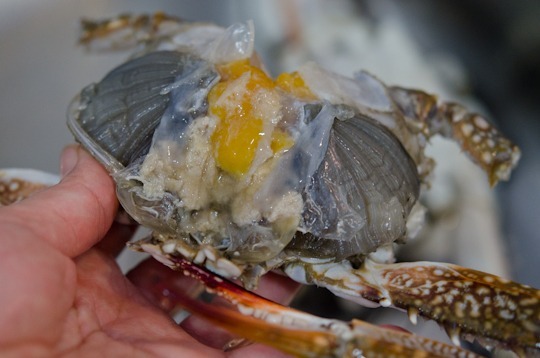 Transfer the eggs in the top shell which has been separated from the crab. 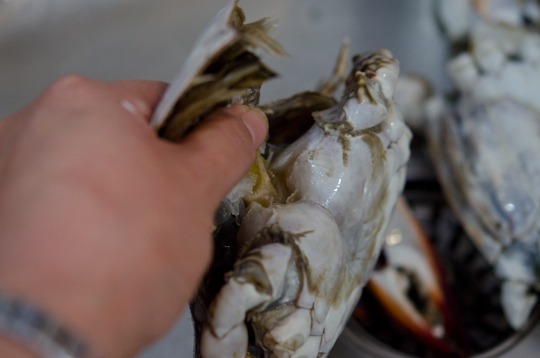 Remove the grey gills and clean and rinse the crabs thoroughly. 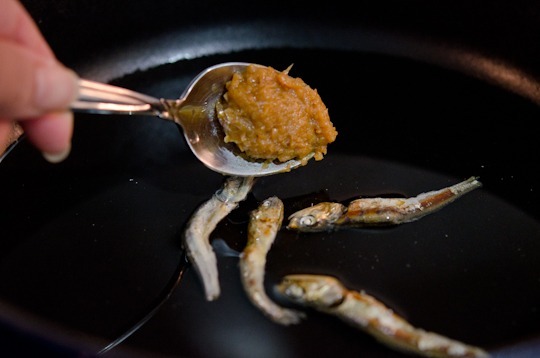 Meanwhile in a shallow pot, combine water, anchovies and soybean paste. Bring to boil and simmer for 5 minutes. 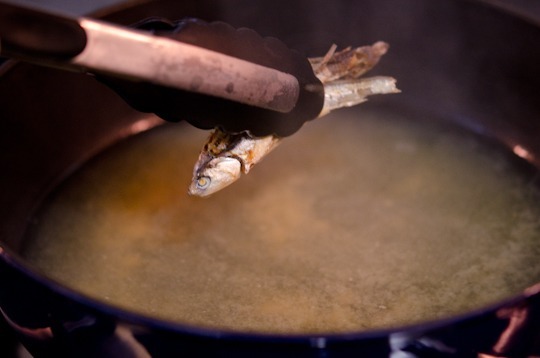 Remove the anchovies and drain the stock to a small mixing bowl. Add all the sauce ingredients to the anchovy stock in a small bowl, mix well. 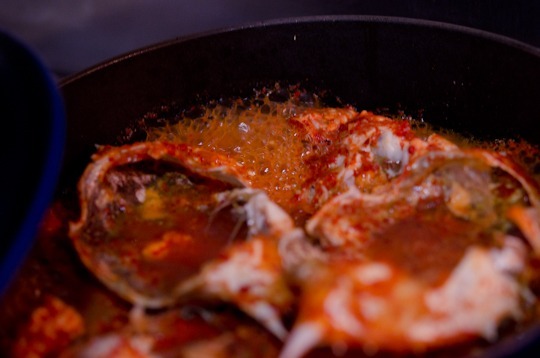 Place crabs and the top shells with reserved eggs in the pot and drizzle the sauce evenly all over. Bring to boil, cover and simmer for 5-7 minutes. Shake the pot once or twice during cooking. 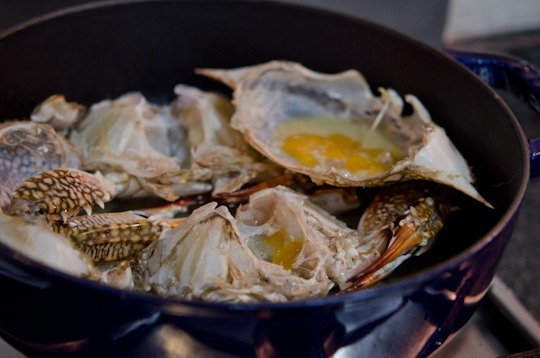 To serve, mix some cooked rice with the sauce and place in the shell to present the dish. Or drizzle the sauce over rice to serve with the crabs. Enjoy! I think I need to make them this weekend. I also love crabs. I assume i could do this with soft shell cabs if I can find them, right? Yes, soft shell crabs will work as well. In fact any crabs will work. Adjust the amount of sauce depends on their size. i love crabs too.. if ever you've started the crabs club let me know i'll surely join ... and look at the crabs pic.. arent they gorgeous and im sure they do taste good as well. I love crab of all description! 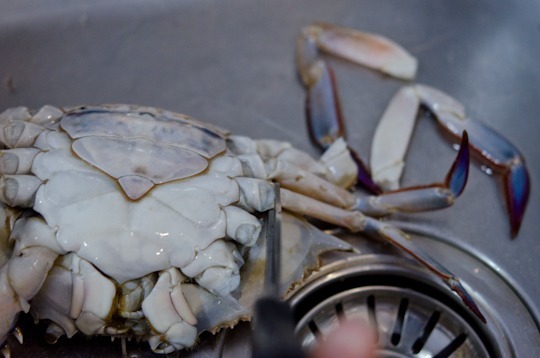 Soft shell are my favorite, but I also love a big crab boil - you boil (or steam) a mess of crabs (Old Bay Seasoning is a must), then with little wooden mallets go about breaking into their shells and slurping out all of that goodness! Good stuff. And great pictures - I've never seen crab eggs before! 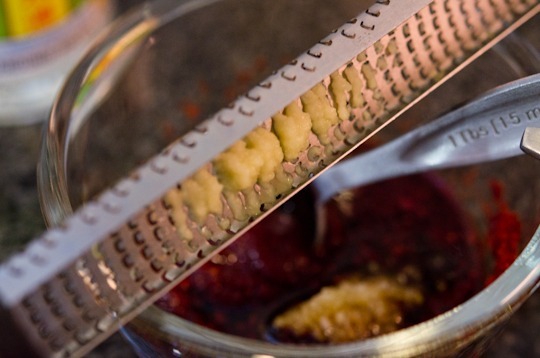 Really good recipe, post - thanks. Thanks Kitchenriff. Wooden mallet is a wonderful tool to have if you are dealing with big crabs. Heck yes crabs! I've only ever had the blue crabs with massive amounts of Old Bay, but I think I would love this recipe. Spicy is always good. Your speckled crabs are quite pretty. Yes to blue crabs and old bay seasoning. And dip the crab flesh in the melted butter... Mmmm good! I found that I'm allergic to crab when early 20s. I love crab and ate a lot when I went to Hokkaido etc, but I always have tummy issues afterwards. I stopped eating my favorite food because of that. 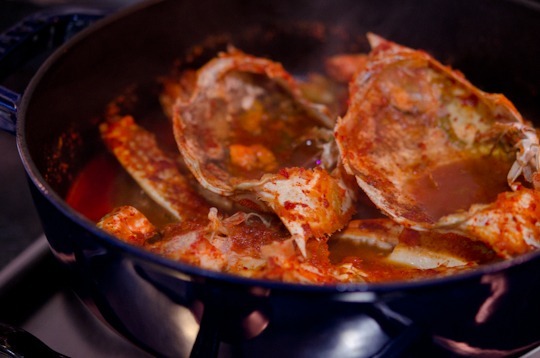 My husband loves crabs and he must love this recipe Holly! Beautiful photography of crabs. 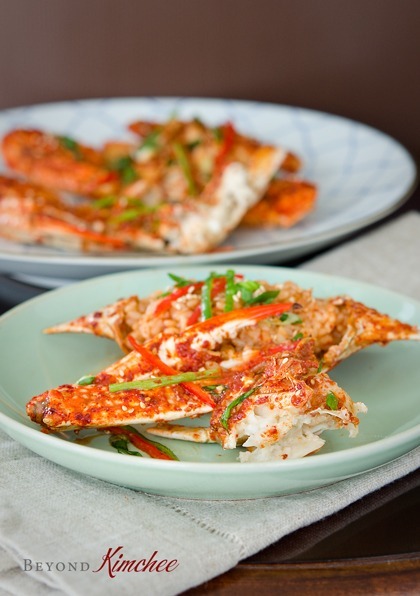 All the crab fans are drooling by these photos! Yay! A crab dish! Now, all we need is crab stew to round it all out! Thank you for your wonderful recipes Holly. I finally finished school so now I have time to enjoy cooking and experimenting with all the recipes I have been drooling over. This sounds delicious!!! HI Holly! While we were in Korea, I was able to eat raw crabs sitting in some kind of soy sauce based sauce. It tasted great. Would you happen to know how to prepare this? 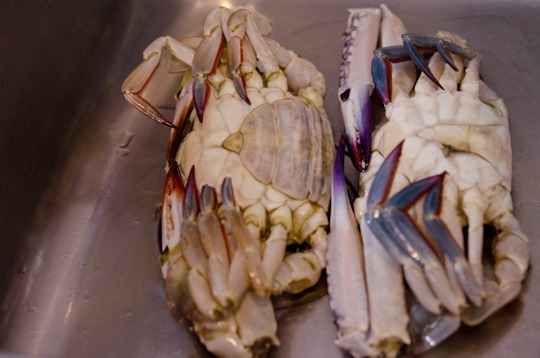 We have a lot of really fresh blue crabs here in the Philippines so it would be easy for me to do this recipe. They also always served hotpots with a soy sauce based dipping sauce with green onions, do you have a recipe for the dipping sauce. Thanks a lot. It must be ganjang gejang. It is fresh raw crab marinated in soy sauce seasoning. You have to use real fresh crab for this dish. It takes some time and skill to make the dish though. If you are still interested in making, I will let you know. The sauce you mentioned is basically soy sauce & vinegar dipping sauce with green onions added. You can also add chillies, sesame oil, sesame seeds depends on the dish you serve with. My daughter had a quick school trip to Manilla last week and she tried a pork dish that is similar to chicken adobo flavor. Do you know what it could be? I wonder how different is this taste to the Chilli crab in Singapore . It will be somewhat different flavor-wise. 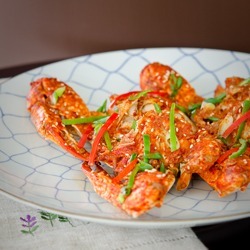 I love Singaporean chili crab, too!